This car is a typical California type car, part open, part closed to allow for the prominent sunshine and the occasional rain fall of southern Calif. 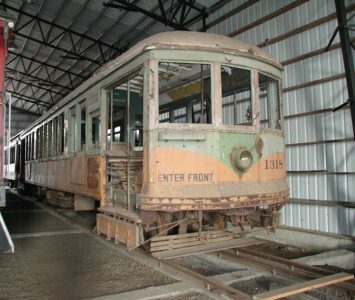 It is a narrow gauge car from the city lines nicknamed the “yellow cars”, since they were of this color. This distinguished them from the red cars of the standard gauge of the Pacific Electric Interurban lines. For the 1949 Christmas season it was painted in a candy stripe design. In 1960, it was retired from service. It is hard to believe that at one time LA had the largest Interurban/ streetcar system in the US if not the world. They were all gone by the 1960’s. The last interurban line to close, in 1961, ran between LA and Long Beach. The last streetcar line closed in 1963. In in 1990’s the first rail transit line in LA opened, the Blue Line between LA and Long Beach, mostly on the original PE right of way.